The book everyone is talking about right now: Between the World and Me by Ta-Nehisi Coates. Go get it! In a profound work that pivots from the biggest questions about American history and ideals to the most intimate concerns of a father for his son, Ta-Nehisi Coates offers a powerful new framework for understanding our nation’s history and current crisis. Americans have built an empire on the idea of “race,” a falsehood that damages us all but falls most heavily on the bodies of black women and men—bodies exploited through slavery and segregation, and, today, threatened, locked up, and murdered out of all proportion. Ta-Nehisi Coates is a national correspondent for The Atlantic and the author of the memoir The Beautiful Struggle. Coates has received the National Magazine Award, the Hillman Prize for Opinion and Analysis Journalism, and the George Polk Award for his Atlantic cover story “The Case for Reparations.” He lives in New York with his wife and son. Ta-Nehisi Coates: "Racism is a physical experience for black people"
The Reviews Are In: Will Ta-Nehisi Coates' New Book Become A Bestseller? Ta-Nehisi Coates Says The American Dream Is A Lie. Is He Right? Free Mp3 Download: Concha Buika's Latest "Vivir sin miedo"
Here's your chance to listen to a little Concha Buika,a Spanish singer who goes by the stage name Buika, you may not be familiar with but should be. Her music will haunt you. Her album Niña de Fuego was nominated for the 2008 Latin Grammy Award for Album of the Year and La Noche Mas Larga was nominated for Best Latin Jazz Album at the 56th Annual Grammy Awards in 2014. From one of the leading lights of contemporary Latin American literature—a lush, lyrical, deeply moving story of a young woman whose passion for the early sounds of tango becomes a force of profound and unexpected change. February 1913: seventeen-year-old Leda, carrying only a small trunk and her father’s cherished violin, leaves her Italian village for a new home, and a new husband, in Argentina. Arriving in Buenos Aires, she discovers that he has been killed, but she remains: living in a tenement, without friends or family, on the brink of destitution. Still, she is seduced by the music that underscores life in the city: tango, born from lower-class immigrant voices, now the illicit, scandalous dance of brothels and cabarets. Leda eventually acts on a long-held desire to master the violin, knowing that she can never play in public as a woman. She cuts off her hair, binds her breasts, and becomes “Dante,” a young man who joins a troupe of tango musicians bent on conquering the salons of high society. Now, gradually, the lines between Leda and Dante begin to blur, and feelings that she has long kept suppressed reveal themselves, jeopardizing not only her musical career, but her life. 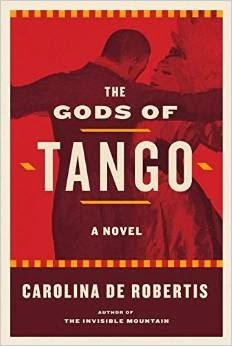 Richly evocative of place and time, its prose suffused with the rhythms of the tango, its narrative at once resonant and gripping, this is De Robertis’s most accomplished novel yet. CAROLINA DE ROBERTIS was raised in England, Switzerland, and California by Uruguayan parents. She is the author of two previous novels, Perla and The Invisible Mountain (a Best Book of 2009 according to theSan Francisco Chronicle, O, The Oprah Magazine, and Booklist), the recipient of Italy’s Rhegium Julii Prize, and a 2012 fellowship from the National Endowment for the Arts. She has spent the past year living in Uruguay, but her permanent home is in Oakland, CA.